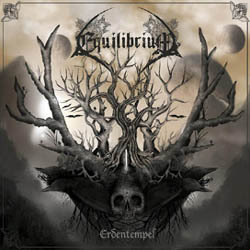 German epic metal pioneers Equilibrium set aflame a new bonfire this summer with their fourth full-length studio album. Guitarist, composer and lyricist René Berthiaume spent almost four years working on the new creation, called “Erdentempel“. The outcome is a very emotional and above all very personal album, that leads back to the roots of the band, without neglecting the bombast of the previous two records. The album was recorded, produced and mixed under the direction of René at Helion Studios and mastered at Finnvox-Studios. The cover artwork was done, just like the one for the “Waldschrein” EP, by Skadi van Terror. “Erdentempel” will be released on June 6th, 2014 via Nuclear Blast and the band has already revealed the titles of its 12 tracks!